View Durbridge’s full SRM power file. 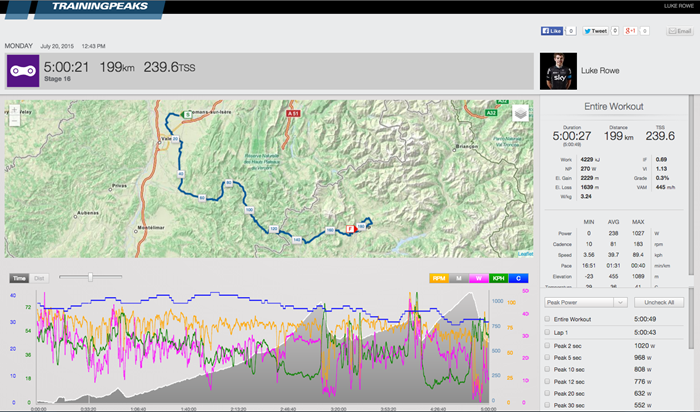 Over the full 170km stage, Durbridge burned 3803 calories and averaged 219 watts. This stage started very fast. 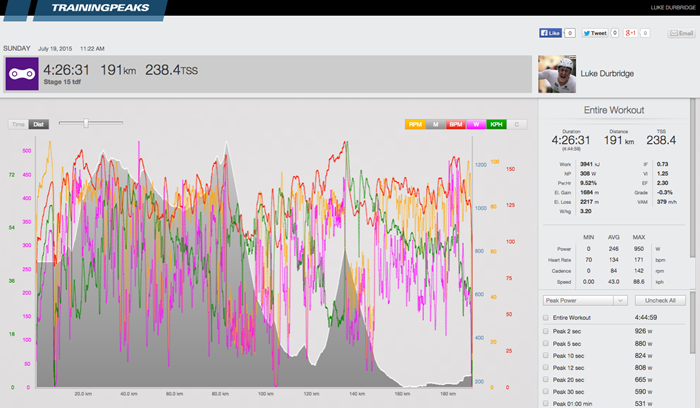 Durbridge set his Peak 5, 6, 10, adn 12 minute power values all in the first 15km. During the final Hors Category climb, Durbridge averaged 270 watts at an average cadence of 69rpm. 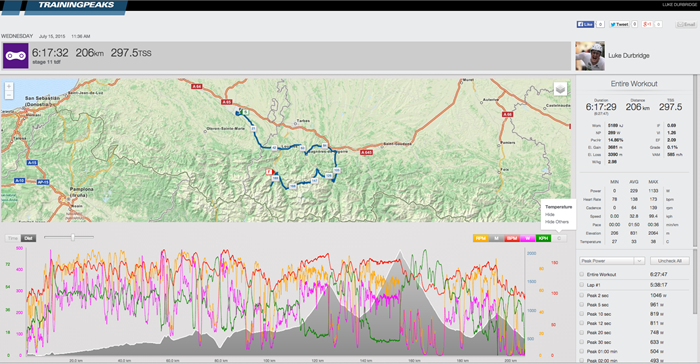 Climbing the Hors Category Col du Tourmalet, Durbridge climbed for 70 minutes averaging 270 watts, or 3.51w/kg. 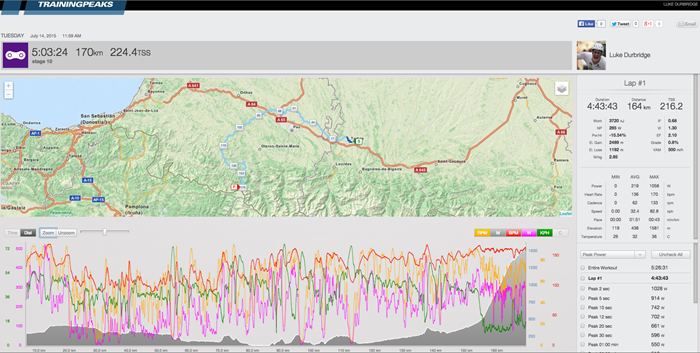 His effort up the Tourmalet came after riding for 3:40 at an average of 250 watts and 37.3km/h. During the stage, Durbridge burned 5029 calories. View Rowe’s full Stages power file. Rowe averaged over 300 watts for each of the first three categorized climbs of the day. The highest being 313 watts, or 4.16w/kg, for 43 minutes while ascending the Col de la Core. During the final ascent on the Plateau de Beille, Rowe put out 277 watts, or 3.77w/kg, for over an hour while averaging 14.3km/h. Riding for over 6 hours, Rowe burned 5397 calories while average 239 watts. 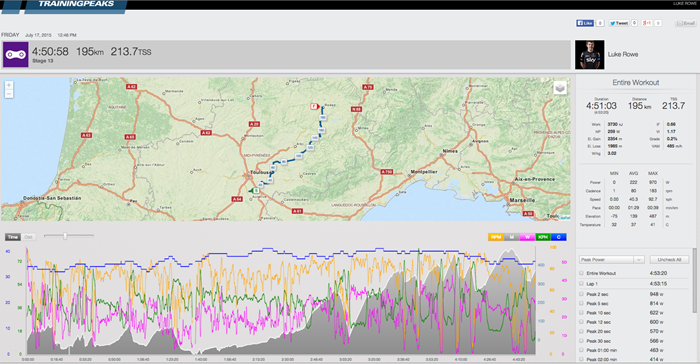 Rowe set his Peak 10 Minute Power of 339 watts on the Category 2 climb of the Cote de Saint-Cirgue. The Cote de Saint-Cirgue is also where Rowe’s Peak 1 Hour Power began, and he put out 254 watt, or 3.46w/kg. Over the full stage, Rowe averaged 222 watts and 40.3km/h. This stage started fast and Durbridge’s Peak 20 Minute Power started less than 10km into the stage. He averaged 366 watts and 38.4km/h. Up the Category 2 climb of the Cote de Sauveterre, Durbridge’s average cadence was 80rpm, and he put out 349 watts for 25 minutes. 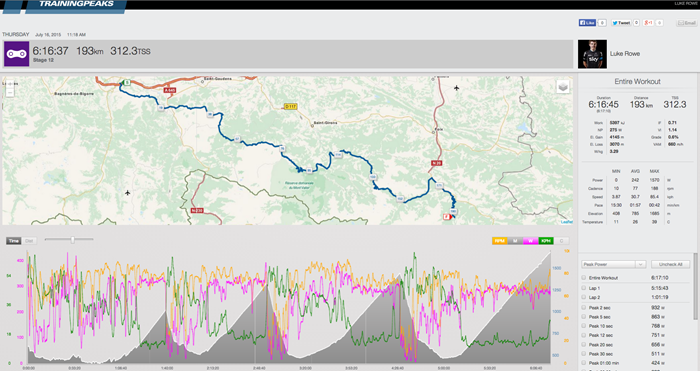 Over the 184km stage Durbridge’s Normalized Power® was 299 watts. 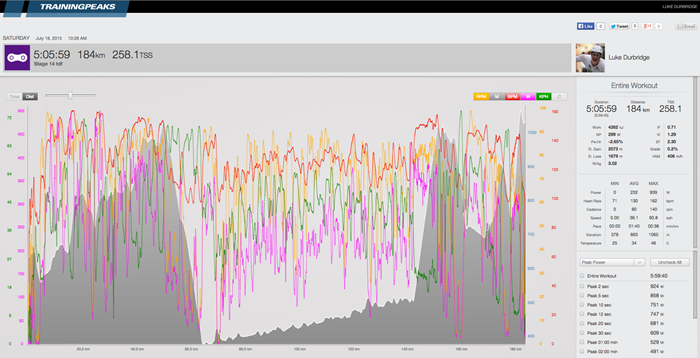 After just 10km of racing, Durbridge started pushing and set his Peak 1 Hour Power of 307 watts, or 3.99w/kg. On the climb up the Col de l’Escrinet, Durbridge set his Peak 20 Minute Power of 374 watts and averaged 79 rpm and 24km/h. 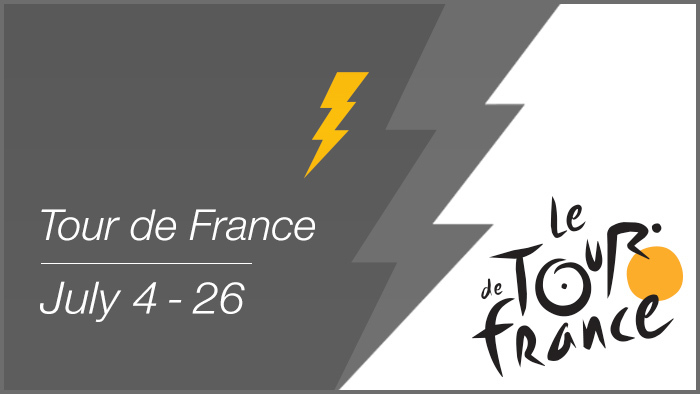 In the final 40km of racing, Durbridge held 47.5km/h and had a Normalized Power® of 288 watts. All of Rowe’s peak power values came at the start of the stage. His Peak 1 Hour Power was 271 watts and he averaged 48.2km/h. Over five hours, Rowe averaged 238 watts and burned 4229 calories.